India’s importance to the dry bulk shipping trades has been changing, and doing so with almost indecent haste. Ten years ago, rapidly accelerating iron ore exports driven by China’s steel industry and myriad small mining concerns eager to make a quick buck on soaring export prices were one of the biggest demand movers and shakers on the bulk carrier stage. Nowadays a clampdown on illegal mining, and the need to reinvigorate supplies to India’s domestic sector, has seen exports collapse amid a flurry of legal suits and counter-suits as miners fight for the right to access international markets. Instead, the evolving nature of India’s dynamic economy has seen the focus of bulk cargo traders and shipbrokers shift to power generation. Economic growth, India’s burgeoning middle class, extensive electrification programmes and increasing industrial activity are all driving the need for more electricity. And as India powers up this is translating into more thermal coal imports by sea. Indeed, such is the turnaround in the net supply-demand of India’s bulk trade in recent years that a number of port facilities designed for iron ore exports are now being converted to handle the vast amounts of incoming coal shipped in increasingly large bulk carriers. According to figures from Drewry, in 2012 India imported 131.2mt (million tonnes) of thermal and met coal. Jayendu Krishna, senior manager at Drewry Shipping Consultants, estimates this rose to a combined figure of more than 150mt in 2013 although with official figures still not available he adds the rider “that it may have been even higher”. This is reflected in electricity output increases. Krishna said coal-fired power electricity generation in India in December 2013 was 14.3% higher than a year earlier. “The largest share of this rise was from the private sector coal-fired power producers which increased output 36% in December compared to December 2012,” he added (see table on p52).“This means that reliance on imports is also increasing because most of the new power plants are relying on coal imports. Despite its huge reserves, national producer Coal India Limited (CIL) has long been unable to meet production targets due to a combination of poor administration, political and policy interference and lack of investment. CIL’s own analysis concludes that India faces a shortage in coal supply of 350mt by 2016/17. This stasis has left a vacuum that new private sector producers have been only too eager to fill, with most new projects located near the coast so they can easily source coal from abroad. But how much coal India will import in the future depends on a range of factors. India’s future coal imports are inextricably linked to its economic development over the last decade. GDP growth may have dipped from the high tempo of the last decade to a relatively measly 3.2% in 2012 and less than 5% last year, according to most estimates, but if India can address its endemic problems of corruption, lack of infrastructure and suffocating red-tape, then investors are expected to flood in, boosting economic growth. HSBC economic Ronald Man, for example, expects India to gradually recover from recent financial shocks to the economy such as the rupee’s rapid exchange rate deterioration against the greenback which saw inflation soar. And, with elections due later this year, an end to the current policy-making vacuum and further commitment to tackling graft and easing the bureaucratic and permitting burden on investors should, according to the bullish Man, see a return to growth rates of 8% per annum through 2020. As the economy expands, so demand for electricity will further surge. Man estimates accelerating growth will translate into a rise in energy consumption of 48% by 2020. And coal, which currently makes up 53% of India’s energy mix, will continue to play a large role, even if India is increasingly, and determinedly, exploring its nuclear options. One major risk to these forecasts is the possibility of a major increase in coal prices. Because power prices in India are fixed, any major hike in cost can render production unviable, although power cuts are just as unpalatable for politicians to explain as electricity price rises. Sourcing, ocean freight rates and infrastructure could also impact import volumes and where they are sourced from. Indonesia currently supplies more than 50% of India’s coal and its proximity offers it a freight rate advantage — an advantage which will become more useful as Sumatran miners ramp up production for export or if freight rates increase. Australia is also a major supplier of coal to India, but is more prominent in the coking coal market than as a thermal coal supplier. The shale gas revolution is forcing US coal miners to look for sales overseas and they are doing so with increasing ambition, not least by deploying Capesize vessels into Indian ports to reduce their freight disadvantage. South Africa is also expected to remain a major player, with Colombia also in the picture. But while demand for coal — both coking and thermal — is set to continue to rise, India’s net impact on bulk markets has been neutered somewhat by its tumble down the international ranking tables as a net exporter of iron ore.
ave seen exports slide. From being the world’s third-biggest exporter in 2010, India now barely makes the top ten, with exports this year forecast to languish at around 10–15% of the 100mt+ shipped in 2010 unless there is a major, unexpected, about-turn in the legal and political landscape. Indeed, the ban on exports has also seen India’s iron ore production drop and some steel makers report being forced to turn to imports to ensure they receive ample, timely, supplies. Exports of iron ore pellets, previously exempt from export duties on fines and lumps, were also hit with a 5% increase in duty earlier this year and further hikes could follow. Another constraining factor on India’s bulk trades is its supply chain capacity. India has long had a reputation as a country where it is difficult to do business due to bureaucracy, corruption and a lack of infrastructure and these are also factors in supply chain management. Sical Logistics, which runs a number of dry bulk ports, said India’s high logistics costs mean that the sector accounts for 13% of GDP, significantly higher than in the US (9%), Europe (10%) and Japan (11%), despite its low labour costs. Logistics costs typically constitute some 20% of product costs, four to five times the ratio of developed countries. Port congestion, lack of road and rail capacity and sudden disruptions to supply chains all take their toll. “The high levels of logistics cost in the economy adversely impacts the competitiveness of the Indian economy as well as the financial well-being of the individual citizen,” said Sical. Many of the new coal power stations are built at or near ports to cut down on supply chain costs, but with volumes expected to continue rising exponentially, truck, rail and port capacity are live issues even though, as Krishna points out, port development in India is accelerating. Paradip port is now deepening approach channels and after completion will have an entrance channel depth of 17.1 metres and approach channel depth of 18.7 metres to handle vessels up to 125,000dwt, for example. Adani has also now won a tender to build a coal terminal at Cochin with annual capacity of more than 4mt. The mining conglomerate also completed construction of a new coal facility at Visakhapatnam in December which offers annual capacity of 5mt and capacity for ships up to 80,000dwt. “At least three private ports — Gangavaram, Krishnapatnam and Mundra — can also handle coal at rates over 100,000 tonnes per day,” said Krishna. A novel solution to coal import terminal capacity issues is the conversion of vacant or underused iron ore export facilities for coal import usage. 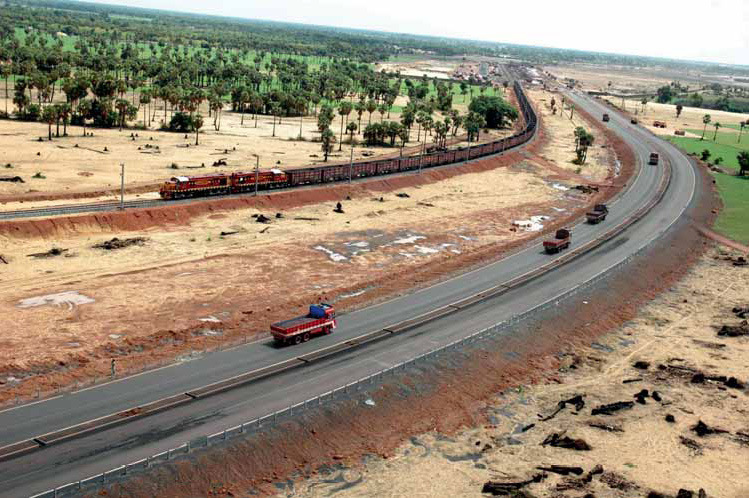 MMTC and its partners Sical Logistics and L&T Infrastructure Development spent some $80 million on building a new iron ore export facility in the boom years. But the facility has not handled any cargo since opening in 2010/11 as it fell victim to bans on mining and exports. The company now intends spending $16m converting the terminal to handle coal imports for power producers in Tamil Nadu state. “The port capacity situation in India is improving for bulk cargoes and port conversions will play their part,” said Krishna.